March 1, 2018	/ 6:30 P.M. The history of Japanese nationalism and expansionism remains a controversial part of the nation-building process in postwar Japan. Many historians have struggled to come to terms with the ambivalent role of the past in the processes of modern nationalism and imperialism. In this respect, the history of the Meiji era is particularly controversial. The Meiji era is rightfully seen as the birthplace of Japanese democracy, but its negative aspects have remained difficult for scholars to unravel. Yet, periods like the Meiji era must be comprehended in their complexity since it was not only the origin of modern Japanese nationalism but also of the Freedom and People’s Rights Movement. In this sense, nationalism was not a singular offspring of the Meiji era but it appeared in conjunction, or osmosis, with a rather liberal political movement. As such Japan’s expansionist policies found some of their staunchest activists in a liberal movement. This talk will focus on the political association Gen’yōsha and its members during the 1868-1910 period. It will show how the association was an integral part of the Freedom and People’s Rights Movement and its spearhead in the Kyūshū region. 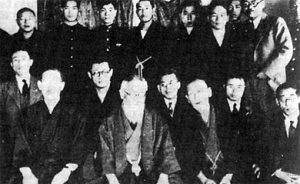 After presenting the historical process that led to the foundation of the Gen’yōsha, it will explain how the group played an instrumental role in the uprising of the so-called tairiku rōnin, and how these political activists where important elements of Japan’s expansionist policies. This talk will also shed light on the relation between the informal activist sphere and the political and military administration and how this relation played a role in Japan’s internal political landscape and in its foreign policies. Grégoire Sastre is a Hakuho Foundation Visiting Fellow at Waseda University. He specializes in modern Japanese history and received his PhD in Japanese Studies from Paris Diderot University in 2016. His dissertation (“The phenomenon of the Japanese agents of influence in Asia, 1880-1915”) focuses on Japanese activists known as tairiku rōnin and the role they played in Japan’s expansionist policies.